Now that Universal Orlando Resort serves hot butterbeer, we thought we’d try replicate it with some hot butterbeer recipes for New Year’s Eve. They turned out pretty darn good! Give them a try and for a little kick, just add a little Irish cream. I’ve modified all the Butterbeer recipes, below to make a single serving. To make more servings, just multiply these recipe amounts by the number of servings you wish to serve! This hot Butterbeer recipe is pretty close to the “real” thing at the Wizarding World of Harry Potter. It’s certainly closer than the two cold recipes that we tried, last week. Put the Butterscotch Chips and Butter in a microwave safe bowl. Heat for 30 seconds. Stir and Heat for another 30 seconds. Now add the Heavy Cream to the bowl. 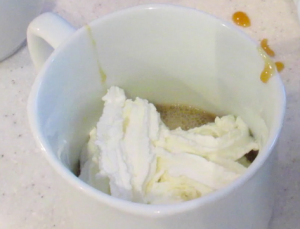 This hot Butterbeer recipe was the clear winner! Tastes almost exactly like the hot Butterbeer served at the two Harry Potter parks at Universal Orlando Resort! Stir in the butter, salt, vinegar and 1/2 heavy cream. Mix in the rum extract. In a medium bowl, combine 2 tablespoons of the brown sugar mixture and the remaining heavy cream. Use an electric mixer to beat until just thickened, but not completely whipped, about 2 to 3 minutes. (When I made this recipe, I went the fast route and just used a can of whipped cream for this step. Worked out just fine). To serve, divide the brown sugar mixture between 2 tall glasses (about 1/8 cup for each glass). Add 1/8 cup of cream soda to each glass, then stir to combine. Fill each glass nearly to the top with additional cream soda, then spoon the whipped topping over each. You may choose to heat the cream soda. 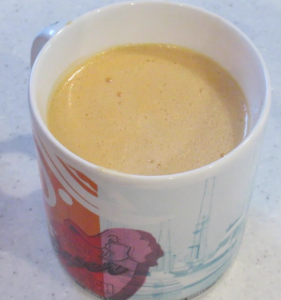 Otherwise, this is more of a lukewarm Butterbeer, rather than hot Butterbeer. Either of these hot Butterbeer recipes could be served cold by either freezing or cooling the final product. As mentioned above, you could also turn them into adult versions for a New Years Eve party or other adult gathering by adding Irish cream and/or substituting Irish cream for the heavy cream. Give them a shot and let us know what you think in the comments!